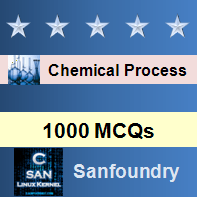 This set of Chemical Process Calculation Multiple Choice Questions & Answers (MCQs) focuses on “Bypass and Purge”. 1. A ____________ stream is one that skips one or more stages of the process and goes directly to another downstream stage. Explanation: A Bypass stream is one that skips one or more stages of the process and goes directly to another downstream stage. 2. A ___________ stream is a stream bled off from the process to remove an accumulation of inerts or unwanted material. Explanation: A Purge stream is a stream bled off from the process to remove an accumulation of inerts or unwanted material. 3. What is A in the process? Explanation: Material that leaves a process unit that is the downstream and is returned to the same unit is called recycle. 4. What is B in the process? Explanation: A bypass stream directly goes from divider to separator skipping the process. Explanation: A bypass stream can be used to control the composition of a final exit stream from a unit by mixing the bypass stream and the unit exit stream in suitable proportion to obtain the desired final composition. 9. Purge stream comes from? Explanation: Purge stream is the removal of unwanted material from the recycle stream. 10. Process simulators are used for the activities like process design, process analysis. Explanation: Process simulation is a model-based representation of chemical, physical, biological, and other technical processes and unit operations in software.